Effective road traffic management depends on numerous solutions skillfully implemented. Which of these solutions is the most critical? Equipment, personnel, planning? 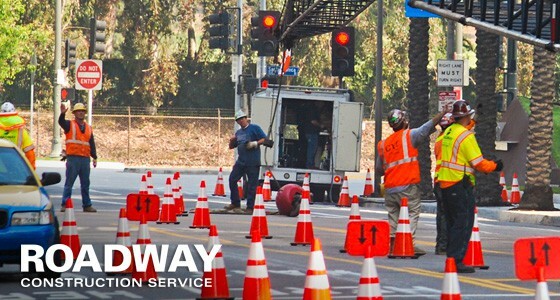 For Roadway Construction Service, the answer is all of the above. Every one of these variables is given equal treatment. On projects big and small, we integrate and synchronize these diverse components into a comprehensive traffic control system unparalleled for safety and efficiency. Our hallmark synergistic approach to road traffic control requires intensive planning and coordination to ensure peak performance. Not exactly a piece of cake. The typical project triggers a flurry of activity – workers, machines, vehicular traffic, pedestrians, and even a pet or two all in motion in the same general area. There’s a thin line between safe, orderly conditions and utter chaos. Fortunately, our integrated approach keeps everything on the right side of this line. One of our first considerations is the selection of road barriers. These protective barricades are particularly important when lane closures are required. It’s no exaggeration to stay they are all that stands between vehicular or pedestrian traffic and restricted areas. The mightiest of these crucial traffic guards is k rail, sometimes known as Jersey barrier or Jersey wall. This is an apt description of these road barricades – k rail literally is a protective wall made of either concrete or water-filled plastic. The former is used for long-term traffic control projects, while the lighter, more portable plastic is typically pegged for short-term assignments. On the personnel front, traffic flaggers clearly take center stage. Roadway Construction Service is proud to say that our flaggers rank among the best. But you’d expect nothing less from people who’ve been so thoroughly trained and educated in the science of traffic control. Without exception, their capabilities are assured by their attainment of key certifications, including OSHA. Whether they’re protecting construction safety zones or special events, our team of traffic flaggers is unsurpassed. Planning is yet another important component of our comprehensive approach to traffic control. When dealing with important matters such as temporary traffic control, a blueprint must be established to maximize safety and ensure smooth traffic flow. Part of this requires the securing of proper encroachment permits. These essentially are approvals for work crews and other project personnel to carry out their assigned tasks in municipal ‘right of way’ areas. Roadway Construction Service has developed a team of savvy strategists adept in the art of securing necessary approvals such as encroachment permits. Not only do we get then, but thanks to our experience and existing relationships with decision makers, we get them in record time. Waiting for important approvals is not something you’ll do with Roadway Construction Service on the job. Would you like to learn more about securing reliable road traffic management for your project or event? Reach out to Roadway Construction Service any time. We’ll be happy to provide additional information and answers to all your questions.